"The stories around Emma and Jenny are super popular among you. Many “Jemma”-Fans from Germany and all over the world already contacted us to express their sympathy for our series-couple. This gives us enough reason to hold a very special Live-Chat – on 7th June at 7pm (CEST) both actresses Kasia Borek and Lucy Scherer will available for a big double-chat. And as there will be two actors in the chat, the usual chat-duration will be doubled to 1 whole hour. Then you will enough time to ask Kasia and Lucy your question. So we are looking forward to many interesting questions." Jemmanation is one big wave of crazy fans which came into the shore of Sat.1, smashed their servers and washed them away into the big wide ocean. We did not get to chat with Kasia and Lucy, but seriously, we enjoyed that day, didn't we? It was as good as getting to chat with them. Even though we didn't get to chat with them we got to chat with each other in the organized chat from our Team and we were around 150 people who had fun just being with each other and watching that wave building and doing its work. We enjoyed being with you! unfortunately the server of Sat.1 wasn’t prepared for this fandom. So they needed to cancel our one hour date. My loves, we will not be able to solve the problem tonight. But this also has a good side to it! There's a LOT of you who want to chat with us! Dear Fans, we, and Lucy and Kasia of course, are terribly sorry, but our technical provider's servers couldn't brave the masses. We sadly, have to abort the attempt at having a chat and will try to comfort you with the prospect of another chat with the two of them in the very near future! Big apologies! But our hands are tied and there's nothing we can do! Jemma-Fans, feel honored, nobody has succeded in doing this before! Admin: Hello dear "Hand aufs Herz"-Fans! We're happy that you could join us today and welcome you to this very special Chat. Today, you have the chance to ask your "Hand aufs Herz"-Stars Kasia Borek and Lucy Scherer all of the questions which always burned on your tongue. 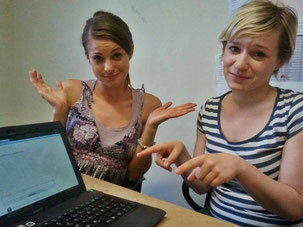 Now you can place the first questions First we say hello to Kasia and Lucy. We're happy that you're here. How are you? Kasia: I'm doing good so far and how are you? Lucy: Hi all of you in the great wide WWW, we are ready and ready to type! Monikajenny: Have you expected the jennyandemmastory to have such an international success? Kasia: No, we never expected this. I'm surprised every day how much jemmafans are out there and are joining this movement day by day. Lucy: No, not at all! I'm totally flashed, and am super happy about all of the positive feedback! Beesigned: Kasia, what has made you consider doing your education as an actor in poland? Kasia: My parents are from Poland and I grew up in a bilinguar family. So that's why I wanted to go back to where I came from. Apfelwurm: Hi Lucy! Are you flattered that with 30 you are allowed to play a 19year old student? Lucy: Yeah...for all of those years still ahead of me, it is probably an advantage to be looking younger than one actually is. If someone asks me at the supermarket, when I'm about to buy a bottle of wine, to show my ID (age of drinking is 16 here)..that's a bit uncomfortable. That just happened recently. Michichamp: Hey you two. How are you? I'm sending lots of good vibes from Hessen. Now my question for you two: Did you like each other from the start when you got to know each other at the set or was it like jenny+Emma in the series? Kasia: Yeah, we're a bit tired, but beside that we're fine. I can only say good things about Lucy. She's a great actress-partner, who sends me very authentic vibes while we're acting und I'm thankful for that and everything we can discuss with each other. But it would be boring if sometimes we wouldn't fight, too. Lucy: Thanks for the good vibes! Fofolle: Kasia, are we going to get to know a bit more about Emma's family or her life outside of school? Lucy: Of course, I'm super thrilled!and thanks again to all my faithful musical fans which probabaly voted like crazy as well! Simmoril: Hi kasia! Hi lucy! can you tell us what else is written in the script beside the lines? Every touch, every look? What are you able to improvise? Kasia: Hm...in the script there is a rough course of action. Most of the time we're following our feelings and change some things spontaneously, so that it feels more natural. Lucy: There are instructions by the director which lead us through the scenes. Depending on the agreements with the director and the rehearsals there are developing arcs through some acting-impulses. So that it can turn out different than the orginal instructions. EmmaAndreaMaria: Hello you two :) How do you like your outfits on the show? Do you have a similar taste for yourself? Or something entirely different? Lucy: Well, in the beginning I thought:OhmygodOhmygod! how weird is Jenny's style? By now I'm enjoying wearing colorfuls leggings myself! :)) I think Jenny owns soome cool pieces that I like, too. Ckbumblebee81: Kasia and Lucy, what do you think about the many international fans? You're probably unawares just how many there are! Kasia: I think it's suuuuuuuuuuuuuuuuuuuuuuuuuuuuuuuuuuuuuuuuuuuuuuuuuuuuuuu uuuuuuuuuuuuuuuuuuuuuuuuuuuuuuuuuuuuuuuuuuuuuuuuuuuuuuuuuuuuuuuuuuuuuuuuuuuuuuppppeeeeeeeeeeeeeeerrrrrrrrrrrrrr! Lucy: I'm always flabbergasted reading comments on my homepage in a language I don't even speak. Cool! Kasia: I love the multicultural exchange and I'd just love to embrace all of you- it feels so unifying, as though we're just one big family! Lucy: I'm rarely in Bavaria, but I still got my room there. Kasia: We're taking our time to laugh so long until we're down again. Because laughing is healthy. Lucy: First of all, we take our time in laughing it all out, --really loudly and heartfelt, suppressing doesn't work at all..it just keeps coming through otherwise. Purzel: Describe each other in 3words. Lucy: fundamentally-good, empathetic and chaotic. Minze67: What were your thoughts when the chat broke down last time? Lucy: We were very disappointed, we already got comfy in front of the laptops, and then went home just as disappointed as you were. George.Sand: Dear Kasia and Lucy. First I'd like to thank you for taking the time to chat with us tonight. My question is: If you could put in a wish to the author team of 'Hand aufs Herz' about where you want to see Jenny and Emma's storyline to go, what would it be? Lucy: That the two of them will do a tour of the Eiffel-tower for their anniversary! Kasia: Hmm...hmm..no idea! I like to be surprised by our authors. It's like getting a present. Mel1567: Hi!! I'm a fan from mexico!!! I just want to say you're great actresses and I love you girls!! Kasia: Thank you for joining the chat. You're very welcome. Hi back to Mexico!!! Gracias!!! Lucy: Wow - thank you so much for your kind words! Sending you back a lot of good vibes around the world – unbelievable that you are watching our work! Enjoy life and have a good time! Chellangel: Kasia what's been your favorite song you have sung on the show?? Kasia: ;)))) I love every song, cause I adore to sing – but joke aside – I guess I love DREAMS, cause it was the first one and it made my dream come true, that you love the Jemma-Story!!! Felixp: Do you miss (Dennis) Hotte? Lucy: YEEEEEEEEEEEEEEEEEEEEEEEEEEEEEEEEEESSS. He left a real gap. Kasia: Oh, you have to ask that? Yes, soo much. :)))) We miss you, crazy Dennis! SabsL_94: What has been more fun for you? The fighting/jealousy- or the love-scenes? Lucy: Both - it's different in color and in the challenge - but both are exciting. Kasia: Hey, you're asking tons of great questions! Well, I like the fighting scenes a lot, since they're super honest and make me think and I like to question things. During love scenes I'm like another half, and I like the energetic exchange. It's really interesting. It's fun trying both! Lucy: Acting with Kasia is giving me so much fun, with her every scene becomes a great experience! There is a great connection and interaction with her and that's the dream of every actress. Deb: Hi you two :) Thanks for taking some time for us, here's my question to you: Were you and are you able to still learn things from each other? Lucy: Yes, of course! Lots! Personally and acting wise. sophie00: What's your favorite Jemma-scene? Lucy: Yes, I liked when Jenny drove Emma home and the two of them had the chance to have a quiet conversation in the car. I think there is a really wonderful energy in that scene. Alnahth: Hey you two! I'm glad that it's working this time. Now my question: To what extent can you identify with your roles? How much fierceness of Jenny do you have in you Lucy and how shy are you really in comparison to Emma Kasia? Kasia: How much is hard to say - actually I have only really discovered my shyness through Emma, which I find beautiful and human. One could see it as a weakness - but weaknesses can become strengths,too. :) Thanks for the question. Dii Argentina: Lucy&Kasia: Did you know that you are having a huge fan community in Argentina?Could you give us a greeting? Excuse my German, please. Kasia: Sorry that we're not able to speak Spanish. - A BIG HELLO FROM LITTLE GERMANY TO OUR BIG FANBASE IN ARGENTINA!! I envy your tango, weather and culture - Buenos Aires must be wonderful!!! Lucy: Hello Argentina!!! I hope you are well!! !Thank you so much for your attention! We will keep on giving our very best in playing our parts. Hugs and kisses. Na-Tascha: Do you think that Jemma has become so successful because "Homosexuality" is a topic still surrounded by taboos? Lucy: Yes, I think it probably is---sadly(!) also a reason for the success of our story. That is supposed to change, and we are very happy if we can contribute a part to that. BeeMe: Kasia, how do you deal with the surge of people conquering your facebook page? They're multiplying day by day! Kasia: Yes, you're getting more and more :))) And there's nothing better than to be told every day that you like my acting. I'm just so sorry that out of a lack of time I can't post as much as before anymore. Concluding from that: You're getting more every day and I'm barely able to read your comments - Keep it going!!! Admin: Dear 'Hand aufs Herz' fans, time is almost up. There are only three questions left. Pinsel: Which dream do you still wish to come true for yourselves? Kasia: I have a lot of dreams, and one of them is to be playing in a Hollywood movie, since I think, that the Americans are the best movie makers in the world! :))))) The best would be to have Robert de Niro as acting partner. Lucy: I would love to do a world cruise, speak and learn new languages in doing so and see and experience a lot!!! Carmenmokka: First of all, I want to give a heartfelt thanks to you for taking some time for us again =) Now, here's my question: Are you being approached about your roles as Jenny and Emma a lot on the streets? If yes, have there also been negative reactions? Lucy: As of now I wasn't asked about Jenny that often. And if I was then it were really nice encounters. Charly: Hello Kasia and Lucy. Can the Jemma fans still expect a surprise? Lucy: The two girls will experience some things that will make them bond more and more. Admin: That was the last question, we have reached the end. Thanks for taking the time and answering the questions of your fans. Kasia: It was a pleasure to answer these great questions. It's sad that we're not having more than two hands to type, because then we would have answered every question, of course! Have a great morning, day, evening wherever you are and look out for yourself. BIG HUGS!!! Admin: Thanks a lot, dear Hand aufs Herz fans for your numerous participation. As a small thank you, you will be able to read the Highlights of today's chat on the page and see the pictures of Lucy and Kasia during the chat. Thank you and have a nice evening. ami&Lied: Thanks for coming out and playing!!! It was our pleasure! Note that those are OpenOffice documents, so your Word won't be happy with these. Witness ami+Lied fighting over Kasia+Lucy. Only a part of the HaheTalk Chatlog. If anyone has an issue with this being put online, contact us and we'll take it down. Wow! Thanks for all your work. So excellent to be able to keep up with what's happening. Did anyone else think that Lucy's comment about an upcoming musical was a bit foreboding? I'm also from Australia and could not make it to 4am to watch the chat, so thank you so much! I look forward to reading the edited version of part 2! thanks a million! I tuned in for the first half, including the chat room where everyone could talk to each other. @radioclare: The musical comment created a HUGE response by everyone in the chat room and on facebook. It was all anyone to talk about for awhile! Gott sei Dank! Thank you so much from Australia also, it's friggin 3am here, I was half a sleep, I couldn't make anything working properly so KUDOS to you guys. You have no idea how much it means, really appreciated your tireless efforts, looking forward on how Emma will fight for Jenny, I wonder if there's a third-party involve???? Was'n Chat... *yay* Danke an alle Beteiligten! "Lucy: The two girls will experience some things that will make them grow close forever!" If HaH hasn't got a confirmed second season yet- I think Kasia indicated that they aren't sure yet- I suppose that Lucy has lined something else up. Hopefully she's just stepping in to a role for a short period and she'll be free again for a second HaH season- let's hope!!!! @eeyelesstrees wrote: "Your comments to each other during the chat were almost as funny as one of HH's recaps: you should keep the unedited chat on the site somewhere!" I agree! I laughed my hat off reading your comments to each other. Everything about this whole Jemma thing is totally fun! I saw it on Lucy's blog.... 2900 questions! woaw we are amazing fans!! @radioclare, you're right! those comments were really funny! Anyway, you can download the complete thing now(look above). It's unedited meaning with all the mistakes we made (Lucy didn't say Jemma will grow close forever, but only that their bond will get stronger and stronger) and with all the guests leaving and joining and with all the bickering that went on between us. @radioclare Is there by any chance you being Clare Lawlor? Oh, and yes, that comment of Lucy regarding a musical had me almost in tears. LOL. It also had me wondering how they plan on sending her character off... But nevermind that. Anyway, thanks amidola and Lied for the live chat translations. You both have cracked me up so much during your banter! Keep it up ;) Speaking of chat, the one for tomorrow, well, I suppose that's tonight your time (7pm German time) is still happening right? Thanks very much for the translation they come across as two really nice and fun people. Thank you to the person who asked about the characters dress sense nice to see Lucy thought the outfits are a bit crazy, at least at first. Looks like Lucy wants to do a lot of things like travel the world and experience different cultures that makes me a bit worried because she might not be on HaH for very long. Anyway this chat has made me love them even more yay!